New Year’s Eve in Italy, as for so many other special occasions, means a special meal, the cenone di Capodanno, or ‘big supper’. Like Christmas Eve, this meal is often “lean” or fish based—at least before midnight, when it’s time to break out the cotechino sausage and lentils for good fortune. (In modern times, however, meat-based meals have started to make an appearance on New Years menus and I understand there are those who eat their sausage and lentils as a second course at dinner.) But while Christmas Eve tends to feature homey dishes like spaghetti alle vongole and filetti di baccalà shared with family, the cenone di Capodanno features an elegant menu enjoyed with friends, as often eaten out as at home. Here’s a simple but elegant way to start a New Year’s dinner: a cocktail di gamberetti or Shrimp Cocktail prepared in the Italian manner. You probably know Shrimp Cocktail as boiled shrimp, usually quite large, served with a ketchup and horseradish dipping sauce. In this Italian version, the shrimp—preferably much smaller or cut into bite-sized chunks—are enveloped in a pink sauce of mayonnaise tinged with a bit of ketchup and scented with Worcestershire sauce and brandy. This concoction is laid on a bed of lettuce and decorated with various toppings of your choice. It’s incredibly quick and easy to make, can and in fact should be prepared ahead of time, freeing you up to concentrate on a more elaborate dishes later in the meal. But you won’t sacrifice taste or looks. As simple as it is, a cocktail di gamberetti never fails to make an impression. If you are poaching the shrimp yourself, bring a saucepan of water with the bay leaf, parsley, lemon and salt to a simmer. Continue simmering for 5-10 minutes to allow the aromatics to infuse. Add the shrimp and continue simmering just until the shrimp turn pink and opaque. Take care not to overcook them (see Notes for details). Drain the shrimp and run them under cold water to stop them cooking. Leave them to drain until you need them for the next step. Prepare the sauce by briskly mixing together all the sauce ingredients in a large mixing bowl. The sauce should be thick but just pourable. If it’s too thick, add a few drops of cream to thin it out. Taste and adjust the seasonings, a bit more salt, or perhaps a dash more brandy or Worcestershire if it needs it. If using larger shrimp, cut them into bite-sized pieces. Add the shrimp to the mixing bowl with the sauce, then gingerly fold the shrimp into the sauce with a spatula. Cover with plastic wrap and refrigerate for a good 30 minutes, or until you want to serve your shrimp cocktail. Lay a lettuce leaf or two in individual serving bowls or dishes. Pile each portions of the shrimp mixture on top of the lettuce. Then top with your choice of one or more of toppings if you like. Pictured here are salmon roe and chives, a particularly pretty and delicious combination. You can serve your cocktail di gamberetti right away, while the shrimp is still chilled, or keep them prepped in the fridge until needed. A cocktail di gamberetti is best made with smaller shrimp, preferably the very small shrimp for shrimp salad known in Italian as gamberetti. These tend to be less appreciated Stateside and so are, ironically, cheaper than larger shrimp. Indeed, I find that the larger the shrimp, the more expensive. But they can be hard to find, so if you use medium or large shrimp, just cut them into bite-sized pieces. Leave the larger sizes like jumbo, extra jumbo or colossal for grilling and other preparations. If you buy frozen shrimp, make sure to defrost them completely before cooking them, or they will cook unevenly. By the time the frozen center is cooked, the outsides will be unpleasantly overcooked. Shrimp can be defrosted very quickly by simply running them under tepid water. The key to cooking shrimp for cocktail di gamberetti or any other dish is avoid overcooking it. Shrimp is cooked as soon as the flesh turns from grayish and translucent to pink and opaque. Shrimp cook very quickly, with smaller shrimp taking a minute or less and large shrimp no more than 3 minutes. As indicated in the directions above, you should run them under cold water as soon as they are done to stop the cooking as soon as they’re done. A perfectly cooked shrimp should be a bit ‘springy’ to the bite, and have a wonderfully fresh, slightly sweet taste. Overcooked shrimp is a real disappointment, as it loses its sweetness and its texture turns rubbery or mealy. When it doubt, better to slightly undercook the shrimp and return it to the simmer for a few moments if it needs it. The key to cooking shrimp for this or any other dish is avoid overcooking it. The pre-cooked shrimp you buy at the supermarket is, more often than not, overcooked. Fish stores are usually a better bet, if you can find one these days, although high-end markets are also generally reliable. Still one good reason to buy shrimp raw (or frozen) and cook it yourself is you can control it is done to your taste. But if you can find a reliable source, you can’t beat the convenience of pre-cooked shrimp. If you buy them raw, you will typically need to clean shrimp. Remove their shells and/or tails and sometimes their heads. This is easily done with your hands. Just gently pull away the head first, then the shell, then finally pinch off the tail, using with one hand to do the removing while the other holds the body. You can do this before or after boiling. Boiling shrimp in their shells is said to produce a tastier shrimp. On the other hand, uncooked heads, shells and tails can lend their wonderful flavor to make a fantastic stock for seafood risottos. You can freeze them until you need them. Personally, I rarely if ever devein shrimp, but if you wish to, run a small paring knife along the back of the shrimp along where you see the vein, then gently nudge the vein out with the tip of the blade or with your fingers. This post provides some useful illustrated step-by-step instructions. The sauce for a cocktail di gamberetti has multiple variations. You’ll get the finest result with homemade mayonnaise, of course. But given the other flavors going on, a good quality store-bought mayo would do just fine. You can “Italianize” store-bought mayo by whisking in some olive oil. While I’ve omitted it in my recipe since I find it too strong for my taste, a spoonful of mustard figures in most recipes. Some recipes call for horseradish, which would be even stronger, and give you a taste rather closer to the cocktail sauce you may be used to. If you want a more subtle hint of heat, try a dash of Tabasco sauce. And while the sauce is traditionally mayonnaise based, some contemporary recipes call for Greek yogurt instead of mayo, for an arguably healthier if, to my mind, less sumptuous and rather too acidic sauce. For the lettuce bed for your cocktail di gamberetti, a tender leaved varietal is preferable. In the US, you could opt for Bibb, Boston or Butter—all distinct varieties of the “Butterhead” family. But really any kind of lettuce you enjoy will do fine—I’ve seen actual Italian recipes calling for iceberg of all things!—as will no bed at all if you prefer. Another contemporary variation, which I personally like a lot, is adding chunks of avocado along with the shrimp. The flavor combination was just meant to be, and the soft avocado adds a nice contrast in texture to the shrimp’s springiness. You do need to fold the avocado quite gingerly into the sauce, as its delicate flesh breaks up easily. Avocado slices are also as the ‘bed’ for the shrimp. Little cubes or wedges of avocado can be an alternative topping. If you are poaching the shrimp yourself, bring a saucepan of water with the bay leaf, parsley, lemon and salt to a simmer. Continue simmering for 5-10 minutes to allow the aromatics to infuse. Add the shrimp and continue simmering just until the shrimp turn pink and opaque. Take care not to overcook them. Drain the shrimp and run them under cold water to stop them cooking. Leave them to drain until you need them for the next step. Prepare the sauce by briskly whisking together all the sauce ingredients in a large mixing bowl. The sauce should be thick but just pourable. If too thick, add a few drops of cream to thin it out. Taste and adjust the seasonings, a bit more salt, or perhaps a dash more brandy or Worcestershire if it needs it. Lay a lettuce leaf in individual serving bowls or dishes. Pile portions of the shrimp mixture on top of the lettuce. Then top with your choice of one or more of toppings if you like. 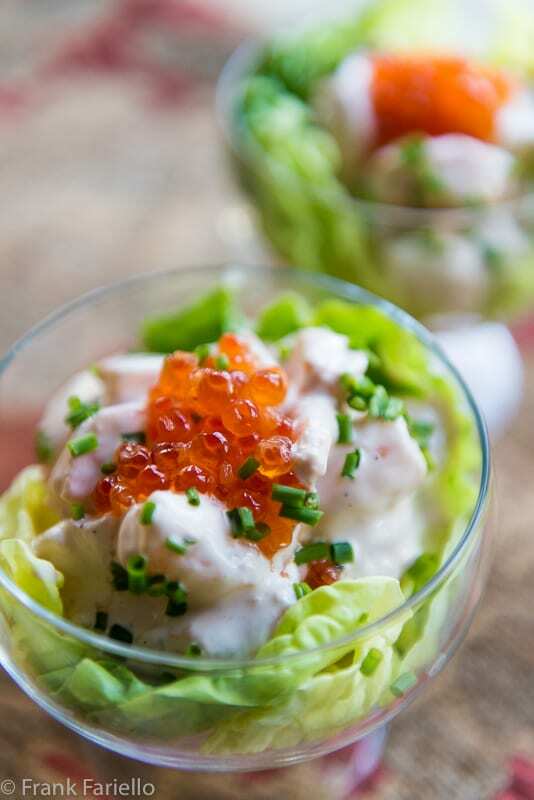 Pictured here are salmon roe and chives, a particularly pretty and delicious combination. Hi Frank, I jumped right over to this recipe when your Valentines menu email pop in my box. Your menu looks fantastic. We’re staying at home and your Cocktail di gamberetti will the perfect starter to go with the Pappardelle Al Ragu Di Cinghiale I plan to serve. Happy Vday 2019! Sounds delicious, Ron! Have a great Valentine’s Day. My mouth is watering right now! I love the recipe, Frank! It totally love this recipe and will try it as soon as I can. Thanks for sharing and have a happy new year! What a lovely presentation Frank and certainly a dish that everyone would enjoy. All the best in this New Year. Wow, pineapple…? I’m with you, Greg. I’ll stick with the salmon roe! I like the American-style shrimp cocktail, but that’s something I want to have only occasionally. Not a very nuanced dish. This, though, I could have all the time. Wonderful flavors. Happy New Year! Thanks, John! Happy New Year to you, too. Wow, that is really gorgeous. I’ve never had shrimp in this way. Thanks, Jeff! Definitely worth a try. Frank – until this post, I knew nothing about the cenone di Capodanno! What a great tradition. I really like the sound of your shrimp cocktail, especially the addition of avocado. Honestly, it would make a nice late lunch – or even supper. Happy New Year – I hope it’s wonderful, flavorful, and filled with great adventures. Thanks, David! Happy New Year to you and yours! buon anno Frank, che questo anno ti porti tante belle sorprese!!! Grazie, Letizia! Buon anno anche a te! I love a shrimp cocktail like the one you made and will make it for one of my dinners. Have a happy and healthy New Year! I’m now craving cotecchino and lenticchie! My mother-in-law is here from Italy so I think we will be having it tomorrow! The gamberi look great! Auguri, Frank…Buon Anno! Have you enjoyed it, Lora. (We had a domestic cotechino and it wasn’t great. 🙁 ) Buon Anno anche a te! An ideal way to start the meal on New Year’s Eve or any other occasion. Buon Anno to you and your Frank, wishing you all the best in 2017. Buon anno anche a te, Paula! Buon anno anche a te Chiara! The presentation is gorgeous. What a wonderful way to start the New Year. We will be traveling on the eve and New Year’s day but we’ll make this for our first dinner when we settle down. Auguri per un buon anno. Thanks, Marisa Franca! Happy New Year to you, too! The presentation with the salmon roe is beautiful Frank. Tanti auguri per un buon anno. And then you added the caviar and really got my attention! Loving this and adding it to my New Year’s Eve menu – which is simple. All the best to you and yours in 2017. Of course this would make an impression, and a very good one at that! Happy New Year, Frank! Thanks, Paola! Buon anno anche a te!